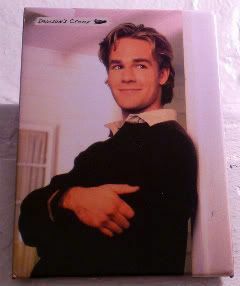 Would you believe that it was either this magnet, or using my last SoapNet swag magnet with the word HUNK on it? Hunk. Just the very word makes me think Hunk Golden, or Sixteen Candles bohunk, or even that Preppy guidebook they pubbed in the 80s. Does anyone remember that pink plaid book? Anyway, I know I'm being silly. But I needed something to giggle myself out of my moody broodiness and woefulness. So I settle for Dawson Leery, because first, NCISGretchen has a new job on Rizzoli & Isles, and because Mercy was canceled, and because, well, just because. It's here where I'll confess something surprising. I totally rooted for Dawson and Joey. No. I did. I can admit it. I was Dawson/Joey all the way. All the way, up until Dawson read her journal. When he did that, I knew they'd never, ever be happy. No matter how cute they were. After that? Hellooooo, Team Pacey. And now I'm sad, because I just found out that Anne Sweeney's shutting down SoapNet. But after that HUNK magnet, I'll have no more SoapNet swag magnets! Won't someone please think of the magnets!!! !